I’ve recently posted two articles covering two different VPN connection methods. SSL Remote VPN and IPSec Remote VPN via Cisco ASA security applicance. In the article I promised I would go thru and do a deteail compare and contrast of them. So Let’s get start!! As promised here is the follow up post I mentioned here regarding setting up an Cisco AnyConnect remote access. Luckly the process is very similar to a remote access IPSec tunnel in the previous article with a few exceptions. Lets work through the differences between Cisco AnyConnect and a standard remote access IPSec Client VPN. NOTE: The table here is a quick reference when comprising SSL remote VPN with IPSec remote VPN. There are many things to consider when choosing between the two. SSL VPN is newer than IPSec, however the answer on which is better is not so straight forward. IPSec remote VPN utilizes a variety of protocols and ports to form a successful tunnel. If you remember from my article on IPSec and NAT-Traversal, port requirements are UDP 500 for IKEv1 exchange, IP Protocol 50 for ESP communication, and if negotiated UDP 4500 for NAT-T. Most of the time these ports and protocols will not be allowed access outbound to the Internet. For instance, many guest networks like hotels and conferences only allow web browsable ports, such as 80(HTTP) and 443(HTTPS) outbound. That is a lot of firewall exceptions to establish an IPSec remote VPN. SSL remote VPN introduces many connection and scalability improvements, making remote VPN functionality easier for the end user. SSL remote VPN solves the IPSec issues of a opening ports to establish a VPN session. Remote users no longer connect differently depending on where they are nor do they need to know how they are connected to the Internet, no fancy ports need to be opened, no issues with NAT-Traversal, etc. SSL remote VPN uses a very common trusted port for communication TCP 443 (and UDP 443, more on that later). This port is 99% of the time open to communicate with the Internet web sites. Using a commonly allowed port eliminates the issues seen with IPSec when establishing a VPN. The trade-off, SSL remote VPN communicates via SSL/TLS. As stated this requires TCP, which is a stateful transport protocol. The issue arises when you have a remote host operating an application that uses TCP as well, such as web browser or Remote Desktop Connection. The scenario is now TCP on top of TCP, resulting in heavy overhead. Imaging the following scenario, you have a SSL remote VPN host connected, they then open a RDP session to a server on your network. So far so good. Now what happens when either the RDP session or the SSL remote VPN session requires a re-transmission because of connectivity problems. TCP re-transmission storms. Both the VPN session and RDP session will require re-transmissions, generating heavy overhead. Now this is not to say that either session will not recover, cause they will unless the connection is completely severed, TCP will do its job. Datagram Transport Layer Security(DTLS) to the rescue!!! Message Fragmentation — Fragmentation occurs when a packet datagram is too large to fit within an MTU (usually 1500bytes’ish). Fragmentation is detected and handled by the transport technology (TCP/UDP). TCP has mechanisms built in to solve this while UDP does not. DTLS solves this issue by introducing its own fragmentation offset and length value in the DTLS message itself. This ensure that both ends of the communication are provided fragmentation information regardless of the underlying transport. Message Reordering — Reordering occurs for several reasons, a common reason is delayed delivery of the underlying network. Reordering isn’t a huge issue for transport technologies like TCP because it uses sequence numbering to ensure the original data is reassembled properly. TLS requires the sequential delivery of packets to preform it’s crypto logic, meaning TLS needs the previous packet to be able to decrypt the next packet N+1. DTLS solves this by adding it’s own sequence numbering to the application, allowing it to not be dependent on the underlying transport technology. Message Loss — Packet loss occurs when a packet in a data stream never reaches its destination in a certain period of time. Message loss is handled very similar to Message Recording. For TLS and it’s TCP transport, re-transmissions are triggered for lost packets when sequence numbering doesn’t compute correctly for a agreed upon window. DTLS fixes this by adding a simple re-transmission timer to it’s application logic, thereby allowing it to re-transmit packets without relying on the transport protocol. Keep in mind that DTLS built-in functionality of these usually transport specific recovery mechanisms creates the need for additional RAM/memory on the server-side. Another cool fact is most of these “fixes” come from IPSec ESP technology! See RFC4347 for more information. As promised here is my article on how to setup a SSL remote VPN, an alternative to IPSec Remote VPN from this article. What’s great is the steps to setup an SSL remote VPN service are very similar to IPSec remote VPN!! So let’s get started. As with IPSec remote VPN we will need similar design considerations for SSL remote VPN. First, a subnet is required for client’s to be put on when successfully authenticated and authorized via the SSL remote VPN. This can be the same subnet as one already existing on your network or a separate one with a firewall in-between The later being best in practice and security. Secondly, deciding on split-tunneling vs all-tunneling. The difference being on the client would you like all traffic to be forced across the tunnel or allow clients to communicate with both their local network and the networks on the otherside of the VPN. For best practice and security, all-tunneling is recommended. Third, Access Lists and tunneled networks. Here we will decided what SSL remote VPN users will have have access to in our other networks. We will also, in the case of split-tunneling, create an access-list of what networks to tunnel for the Remote VPN user. Fourth, provisioning standard network services for VPN user’s. Remote VPN user’s will need a default gateway, DNS servers, domain suffix, an address pool, proxy settings, etc. I’ve posted an article on Client VPN setup using OpenVPN and I noticed I didn’t have one regarding Cisco ASA. A Cisco ASA being a very common Security Appliance used by small and large companies. This article will cover how to setup a standard remote client VPN utilizing IPsec as the crypto carrier. Cisco also has their own proprietary remote client VPN solution called AnyConnect. I will be posting an article after this one on how to set an AnyConnect solution up and include what the differences are between it and the standard IPsec remote client VPN contained in this article. A remote client VPN is something very common in workplace now-a-days. It allows users to appear as if they are on the company’s internal network over an insecure medium(e.g. Internet, untrused Network, etc). It does so by using IPsec. IPsec is a tried and true Layer 3 securing technique that requires both parties involved to mutually authenticate each other before passing traffic. A few things to keep in mind regarding remote client VPNs. First, a subnet is required for client’s to be put on when successfully authenticated and authorized via the remote client VPN. This can be the same subnet as one already existing on your network or a separate one with a firewall in-between The later being best in practice and security. Third, Access Lists and tunneled networks. Here we will decided what Remote VPN users will have access to other networks. We will also, in the case of split-tunneling, create an access-list of what networks to tunnel for the Remote VPN user. What is an IPsec Site-to-Site VPN? Most of the time when we are trying to establish a site-to-site or LAN-to-LAN connectivity between two independent parties over an untrusted medium we rely on IPsec. Internet Protocol Security (IPSec) is a open standard suite of protocols used to authenticate and encrypt IP Packets in a connection. This ensures data integrity and data confidentiality. IPsec can be used in a variety of ways, to secure host-to-host communication, network-to-network communication, host-to-network. The most common type is network-to-network. An argument can be made that host-to-host is the same as network-to-network with /32s (i.e. 192.168.1.1/32 to 192.168.255.1/32). Anyway! IPsec allows us to form a secure virtual communication link over a untrusted medium such as the internet to allow LAN to LAN communication. Sound familar? VPN anyone? For instance if CompanyA with 192.168.1.0/24 address space and CompanyB with 172.16.1.0/24 address space require hosts on each of their networks to talk to one another, this can be accomplished by utilizing a IPsec tunnel. Hosts at CompanyA would be able to traverse the IPsec tunnel to CompanyB as it appears to them to be nothing more than another routed LAN. It’s a cheap and easy way to create this linked infrastructure without the need to buy or lay-down physically dedicate cabling. Why not piggy back and on an already existing insecure circuit and make it secure with IPSec!! Phase 1 and Phase 2 ??? “Phase 2” — IKE is used to negotiate IPSec SAs and how IPSec should be protected. In this Security Association (SA), the actual networks at each end of the tunnel must be agree upon. If they are not, Phase 2 will never come up as their SA are in mismatch. Furthermore, in this Phase 2 an agree upon Transform-set is established. The Transform-Set is the method on how the packets will be encrypted and transmitted out the tunnel interface. How should we transform the packets through the tunnel? Phase 2 also uses the key exchanged from Phase 1 to be used when encrypting the data. If PFS is used, keys are derived independently and not from Phase 1. The cost being time, benefit being a single key compromise does not compromise all IPSec tunnels. Keep in mind Phase 2 is required to be completed at both ends. If not the opposing side won’t know how to decrypt the data!! So in summary IKE is used to protect Phase 1 and Phase 2, IPSec is used to send the packets. If you want to understand these steps further, I recommned reading this overview. It is a great explaination. Also if you haven’t already bookmark PacketLife.net!! Difference between Tunnel and Transport mode is in Tunnel mode the complete IP packet with header information is encapsulated and encrypted, in Transport mode only the TCP/UDP payload is encrypted. Openswan U2.6.37/K3.2.0-4-amd64 w/NetKey Support connecting to a Cisco ASA 5505 running version 9.1(3). I include the versioning because I read a lot of articles where the version of OpenSwan matters tremendously, and also seems to influence what types of issues you might run into. The version I am running uses a fairly new feature called NetKey. From my research this was introduced to make configuring a IPSEC tunnel easier and not require the re-compiling of the Linux Kernel. Before we begin I want to clearly identify the scope of this tutorial. There are different types of VPN, we will be creating a Client VPN which implies a many to one relationship. We will have multiple clients connecting via VPN to a single OpenVPN server. 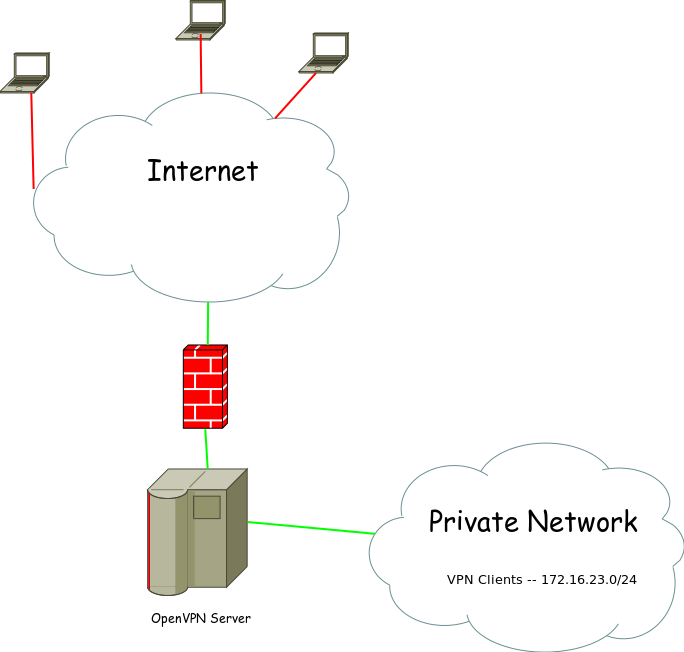 This OpenVPN server will assign IP addresses to each successfully authenticated client. Using this IP Address, client’s may, depending on your network security, access devices on a private network. Effectively appearning as if the Client was directly tied into the Private Network. If you are looking for a site-to-site VPN tunnel via IPSEC this is out of the scope of this tutorial.